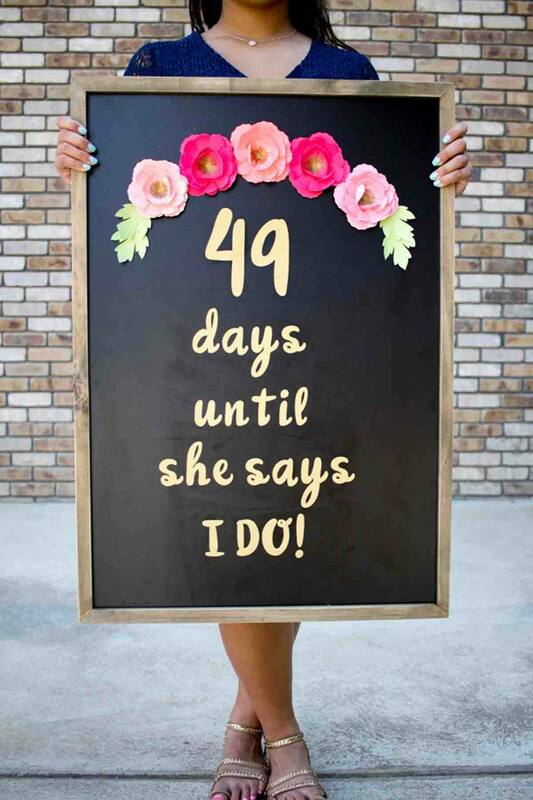 Make a wedding day countdown board that greets your guests as they enter the bridal shower party room. Use a black chalkboard as the base of the sign. A chalkboard plus is that the bride can reuse the board in her home after the big day! Cut out the lettering from glittered vinyl, and then surround the lettering with paper flowers. This decoration is quite stunning and will draw compliments from all the guests. Make these sweet origami boxes to hold favors for your bridal shower guests. Dekotopia offers a pdf download pattern in both green and blue. Fold your boxes then wrap with a beautiful ribbon. Finish your gift package by tucking some silk or real flowers into the ribbon. Such a simple but elegant favor package. The Prettiest DIY Butterfly Balloons! No party decor is complete without balloons! These balloons are decorated with butterflies and would be perfect decor for an outdoor event. Just fill balloons with helium and attach paper butterflies to them. The balloons will have a lovely feminine touch and will add ambiance to your garden party. Have some photo fun at the shower by taking pictures of the bride and her guests using a giant polaroid frame. So cute! All you have to do is cut a square into a sheet of poster board to make this whimsical photo prop. It doesn't get much simpler than this! Make sure to hop on over to A Crafted Passion and read the rest of the tutorial. Amada will share the remainder of her tips and tricks for hosting a successful backyard bridal shower. Vintage watering cans with paper flowers are an easy and fun way to decorate for a spring bridal shower! Check out the tutorial and discover 8 more paper flower crafts to try. Add some fun to your bridal shower with doughnut diamond engagement rings. Buy some store-bought doughnuts and top with a glittered paper "diamond"! This party craft is an easy and no stress solution for quick bridal themed party decor. If you're hosting a bridal shower tea party, these easy origami tea plates are a fun way to spruce up the tablescape and prevent excessive droplets of tea from staining the tablecloth. Use decorative or patterned paper to create pretty and unique tea plates. Getting married is a major life event! Make a photo banner with pictures of the bride in various stages of her life. Scan photos into your photo editing software, enlarge if you wish, print and then hang on sisal with clothespins! This banner is a great conversation starter! Your bride and guests will love looking at the photos and reminiscing. Every bridal shower needs some party games and this printable would work well with the tea party themed bridal craft. The object of the game is to look at pictures of the bride and then write down whatever age you think she was when the photo was taken. The person who guesses the most correct answers is the winner! Quilling is the art of rolling paper strips into decorative shapes and gluing these shapes together in a decorative pattern. Make some beautiful quilled flower shaped candle bases in your choice of paper and color as table decorations. These quilled flower bases are a very inexpensive way to add a pop of color to your table decor. When working with paper and candles make sure always to remember to be safe. It would be a good idea to place the candles into a glass container and then place on the quilted base. This doily snowflake bowl would make a beautiful decoration for a bridal shower. It's perfect for candles, petals or little handfuls of candy. If you are planning to use it as a candle holder always remember safety first; it might be a good idea to use a battery operated tea light instead of a regular candle. Buy some large paper mache letters at your local craft store that are the bride and groom's first name initials. Glue on shiny sequins and use them as stunning table decor! This decoration has lots of visual impact, yet is easy and fun to make! Make a lovely lace paper cut banner as bridal shower decor. The banner spells out the word love and is so delicate and feminine. You will need an electronic die cut machine with software the uses SVG's to produce these cut paper squares. If you own one, you will be able to cut out the banner pieces in almost no time! Crepe roses are a beautiful floral table decoration. Although real flowers are lovely, crepe paper flowers last much longer. Organized party planners can make a stunning crepe paper flower display well ahead of the planned party, which can be time-saving and stress-relieving. Some crepe paper flowers almost look like their real counterparts. Make some cute paper wedding dress decorations for a bridal shower. These cutouts can be used as cake toppers, table decor or even made into banners. The dresses can be cut out on a digital die cut machine or even executed by hand! This simple decoration is adorable and will add fun to your bridal shower party decor. Cupcakes are perfect to serve at a bridal shower. You will be amazed at how easy it is to make your own cupcake tower out of paper. Learn how at Annie Eats. Lia Griffith says these papercut candy poppers are for Valentine's day, but they could also work very well as a bridal shower favor. Keep up the love theme by filling the paper poppers with heart shaped candies. So cute!